I was stunned earlier in the week to be shown this campaign poster on the left from Hertfordshire Safeguarding Children Board. Apparently it's not new, it has been used for around a year - and it isn't a stand alone piece of "anti bed sharing prophaganda" either. 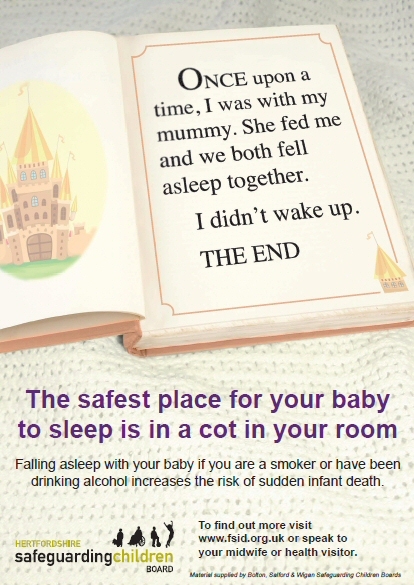 Now on both posters the small print at the bottom clarifies that sleeping with your baby if you smoke, have had a drink or taken drugs is dangerous. Is that the message you instantly take from the main pictures? The ironic thing about this second poster is that the small print confirms that a soft surface like a sofa poses the biggest risk of all - and indeed it does, but that's where mamas end up, sat trying desperately to stay awake. The trouble is breastfeeding delivers a massive hit of hormones to both parties, which increase at night to relax and induce sleep - this can make it near impossible to stay awake, particularly if you're a tired new mum. You can read all about the very real dangers of demonising safe bed sharing in a previous blog entry here. But the one question I keep coming back to about these posters is why? Why when budgets are tight and Lactation Consultant positions are vamooshing from hospitals, is money being spent on such campaigns. Of course infant health and SIDS are hugely important, but what I mean is why pick this particular message to send? One might reasonably assume that bed sharing must be the biggest risk facing infants, but this simply isn't true - furthermore overlaying ie suffocation is not SIDS; a point that I think it's important to bear in mind. "Although the risk was strong if they had crashed out on the sofa, it was only significant among those in a bed if the parent had drunk more than two units of alcohol or had been taking drugs." Right so there wasn't an increased risk unless other risk factors discussed were involved. Why don't the adverts feature a sofa and alcohol, wouldn't that send a clearer message about what is actually dangerous rather than a tiny message at the bottom? Oh but wait, 46% of deaths were in a cot right? What's also interesting is that women most likely to fall asleep feeding are breastfeeding mothers. Bottle feeding mums do not get the hit of sleepy hormones - and far fewer bed share anyway, so who exactly is the target audience for this ad campaign? And what size is this audience? Won't the vast majority of people pat themselves on the back for using a cot? But does anyone mind if I mention at this point that non breastfed babies are at double the risk of SIDS. Why no posters highlighting this key fact? Perhaps the one below might suit? Can't see that hitting the surgeries any time soon can you? Imagine the amount of people that would be upset by that message. 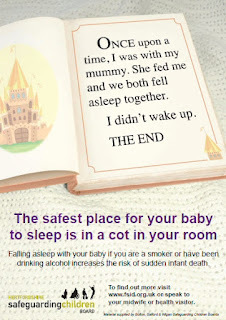 No, the co-sleeping posters are a much safer bet - but it's all about reducing key risks right? Consider how many people don't breastfeed compared to how many bed share and don't use a cot - which message do you think is likely to have the biggest impact on SIDS rates? Hmmm but sending a message involving breastfeeding might mean the NHS have to step up and actually provide consistent effective support rather than being propped up by the voluntary organisations - and that would never do would it? For the record I don't think such posters would be effective, I am not seriously putting these forward as "alternatives I would like to see". I am attempting to highlight how inappropriate and offensive such tactics are. What those producing posters like those at the top currently in use fail to consider, is that bed sharing is also known to protect breastfeeding rates. Human infants feed frequently during the night and getting up, feeding, resettling can be exhausting - then we tell mums they have to stay awake when feeding, despite all the biological changes taking place to induce sleep? Stopping breastfeeding with the belief this will create longer artificial sleep spells can follow, or because they're so scared about falling asleep feeding they mistakenly think a bottle will be "safer". At what impact to the SIDS rate? Breast-fed babies develop a more energy-efficient and rhythmically functioning autonomic nervous system, which controls infant arousal, than bottle-fed babies, says Philip Zeskind, associate professor of psychology, who studied the sleep-wake patterns and heart rates of breast-fed and bottle-fed newborn infants. "Our results suggest that the behaviors of breast-fed infants are physiologically more desirable. Feeding infants formula may make them sleep more and may disrupt the smooth running of their arousal systems." Indeed some sources suggest bed sharing may not be safe for those not breastfeeding - but it's easier to tackle the issue of the small number of people doing that with a blanket campaign, than it is to improve breastfeeding rates right? 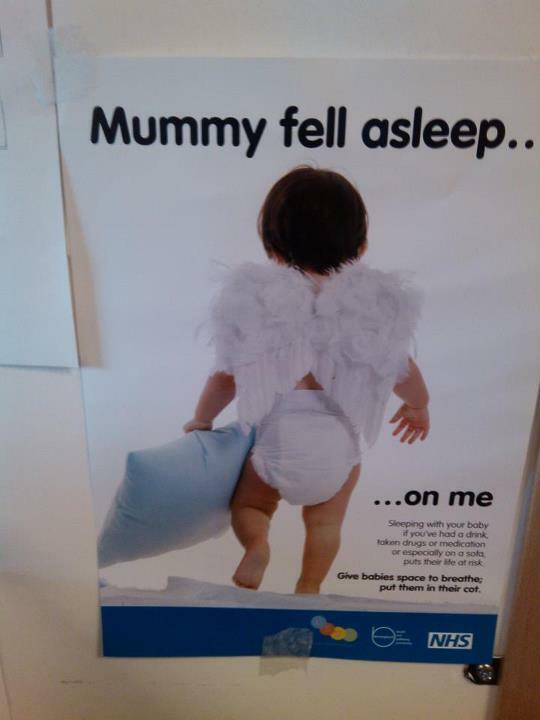 As a final note - anyone find it bizarre that the angel baby in the Birmingham poster is wearing a disposable nappy? It's great they're so gung ho about environmental issues. Why sleep training is like crash dieting. I loved this post! I particularly got a kick out of your adaptations of posters. I know it wasn't your main purpose, I wish I could print them and tack them up at some hospitals in my area! Fundamentally, I still don't understand how this message that we should keep our kids further and further from us by using formula, sleeping in separate beds (if not separate rooms), and using mechanical devices to sooth and monitor is so successful, because it goes against every biological instinct we have. I was advised to co-sleep by a breastfeeding support worker in the early days when my (now 8 month old) baby wouldn't sleep in his Moses basket. She directed me to the World Health Organization guidelines on how to do it safely (including the correct positioning etc). I can't find these guidelines now, but they were useful. We were nervous at first but once we got the hang of it it seemed to work well. I think these posters are unnecessarily alarmist, because as you say, they don't convey the facts accurately, but rather are designed to put people off altogether. who do we complain to about this advertising? They have forwarded my complaint on to the "multi agencies" responsible, maybe they will take notice if they get a flood of complaints! I'm surprised to see it given that the UK is one of the first Western nations to have an official stance supporting bedsharing when done safely (thanks to the work by those at ISIS and similar organizations). It's just so sad to see companies spend their money this way. I agree with Dr. Ball who said she believes it's an attempt to have another huge drop in infant death as they did with the Back To Sleep campaign. Such a pity. I find this post and the pictures very offensive. My son died from bed sharing! He was exclusively breastfed, I was not high, drunk, or taking any medication!!! I know the media portrays moms rolling over on their baby when they are under the influence, but just because the media shows it doesn't make it the norm! I started a page on fb PAUSE (Parents Against Unsafe Sleep Environments) and we have over 20 moms who lost their babies to bed sharing or unsafe sleep and not one of them was drunk or high. More babies die in an adult bed than in a crib!!!! And my daughter died in a cot in her own room. There we go. PSS - "My son died from bed sharing!" I'm very sorry to hear of your loss, I understand this must be a sensitive subject for you and one which it must be hard to address objectively - but visit other websites and there are hundreds of mums who weren't bed sharing who have had infants who have sadly died, including those who have felt it safer to head to the sofa and then fallen asleep there . I think the distinction between SIDS and overlaying is an important one to make. On our Facebook page there are numerous bed sharing mothers who have woken just before or at the point a baby was struggling and who felt the outcome would have been very different had they not been in the same room or sleep space. The research as highlighted above, just doesn't support bed sharing being more risky than a crib when risk factors are removed. Although Sears & Mckenna would like people to believe bed sharing can be done safely with minimal risk, this isn't true. Babies who bed share have risks that you will not find in a crib (if the crib is safe meaning no bumper pads, blankets, stuffed animals, etc.) We would never recommend a baby sleeping alone in their room but room sharing for at least the first 6 months of life. Although I agree there is a big difference between SIDS & SUID (i.e. suffocation due to bed sharing) they often look the same. Both deaths usually do not leave signs. Many people believe an autopsy will show if a baby died from suffocation or over lay but their bodies are too small, compared to the signs that would be left if an adult was suffocated. 12 babies ever day are dying from unsafe sleep not just bed sharing, but from bumper pads, blankets, pillows, stuffed animals, etc. As far as scientific research the only thing it shows is that bed sharing puts a child at risk for death and that it isn't harmful for toddlers emotionally. It sadden me that so many people listen to the advice of these quacks, if you want real answers talk to your local medical examiner. 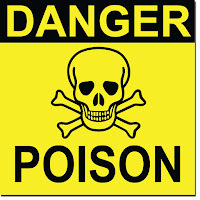 Babies are dying from bed sharing, maybe some awake if a child is in danger but when a child suffocates they don't make a sound, so how could parents wake up? If all parents woke up, thousands of babies wouldn't be dying every year from SIDS & SUID. Did you know a study conducted 80 % of babies who die from sleep related deaths are found in an unsafe sleep environment? You want a way to protect your baby room share....you can still be close to the baby without worrying if a baby will suffocate on a blanket, pillow, or a parent will roll over on them! We don't make money educating parents, we do it to save lives. No one should lose a child to such a preventable death! PSS I really didn't want to engage in a huge discussion as it feels insensitive given the loss of your baby, but I feel I can't not reply either. "Babies who bed share have risks that you will not find in a crib (if the crib is safe meaning no bumper pads, blankets, stuffed animals, etc.)" To my mind the big risk a child in a cot has is that there is even less chance of a parenting sensing and responding ICE. We know babies sleep differently when they're either artificially fed or separated. If you had read through any of the linked words in my blog, you will see I pull research from much further afield than "Sears and Mckenna" including the professor quoted in this study who found no increased risks of bedsharing compared to a cot when said risk factors were removed. It also ignores research from other fields - ie the neurological research from Nils Bergman (also linked to) that highlights the abnormal stress signals demonstrated in a baby when separated from their mother - a change in heart rate, breathing, sleep patterns, oxygen sats. Your response doesn't address any of the points I've made - the fact that artificial feeding has been shown repeatedly to massively increase the risks, causing abnormal sleep and response patterns, are you also campaigning as "parents against unsafe feeding practices?" You've not made any acknowledgement to the risks discussed of demonising bed sharing, how that in itself is responsible for infant deaths? Or how trying to scare mothers into not bedsharing results in shorter duration of breastfeeding and thus increased risk of infant death and illness. What about the research showing children are drawn to and regulate their breathing when placed next to a "breathing machine" (after being removed from natures ready made version) so much so it drastically reduces apnoea in prems. What about cultures who bedshare but have very low rates of infant deaths? Going right back to cavewoman it's unlikely she would ever have put a young baby down given it could be eaten by a tiger, and it was much further along in history before people could even afford separate sleeping spaces. What about apes and the fact mum and baby sleep together whilst dad sleeps in a separate nest, in fact does any other species of mammal put it's infant somewhere separate when they have to feed frequently? You disregard Mckenna but have you ever really sat and read all his papers? His years of filming and observing mother baby pairs and how his findings tie in with those from other fields? If you unpick many studies cited against bedsharing, you will see "bed sharing" often includes falling asleep sitting up feeding (ie unplanned bed sharing) falling asleep on a sofa, being overlayed by a sibling or partner. They don't differentiate from exclusive or mixed feeding, or if they do only for a very short period of time. "12 babies ever day are dying from unsafe sleep not just bed sharing, but from bumper pads, blankets, pillows, stuffed animals, etc." - but how many per day are exclusively breastfeeding without known risk factors in this scary sounding stat? How many babies are dying per day who are placed in a cot? Which study are you quoting?
" He was exclusively breastfed, I was not high, drunk, or taking any medication!!! 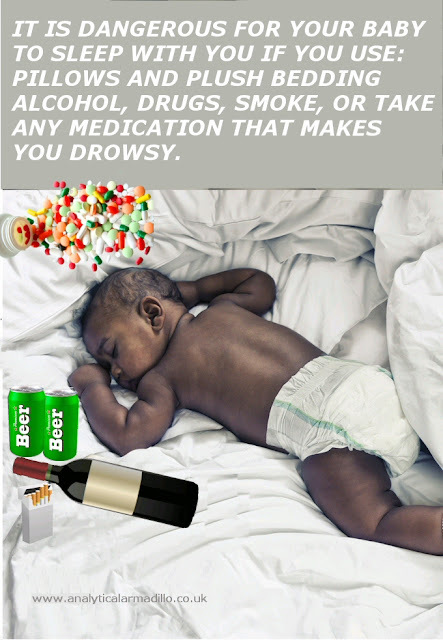 I know the media portrays moms rolling over on their baby when they are under the influence, but just because the media shows it doesn't make it the norm!" No, I think what the overwhelming evidence tells us is that when mum is exclusively breastfeeding, isn't drunk, high or taking medication (plus is free of other risk factors consistently demonstrated in studies such as bedding, baby only next to mum, mum not bringing baby in as exhausted rather than a "regular bed sharer" who is likely to be much less tired,isn't excessively obese and so on), the risks are no greater than if baby was in a cot. With some believing and demonstrating it is significantly safer. I understand that having something to blame over the loss of an infant perhaps helps, there will of course be genuine cases of a tragic accident - like the mum who fell asleep breastfeeding her infant on a flight last year and slumped over her baby, a baby with something that may have caused a problem wherever he slept. 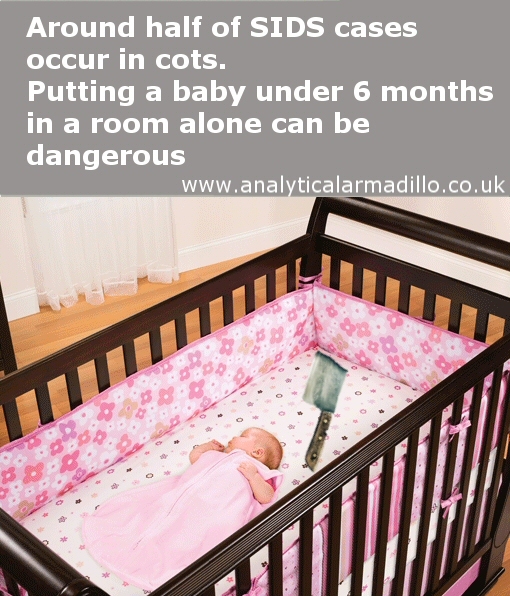 But ultimately as many infants die in supposed "safe cots" as do in a planned "safe bedsharing" environment. I don't therefore understand how focusing on this is effective in terms of actively reduce infant death? Eliminating all the other risks you highlighted such as toys/pillows etc absolutely, but to accurately assess the risks of safe bed sharing, you also have to consider the knock on impact of such recommendations. Wouldn't slashing artificial feeding rates actually make significantly MORE of a difference? Somebody has been busy shoppin'. Love it! "Consider how many people don't breastfeed compared to how many bed share and don't use a cot - which message do you think is likely to have the biggest impact on SIDS rates?" Nail well and truly hit. The NHS support of breastfeeding is piecemeal at best and hypocritical at worst. Not to mention their courting of formula companies. PAUSE - would that be the same group that ban and delete members for attempting to engage in dialogue with you? And who on occasion are downright offensive to those of us that cosleep? My son would not be here if he hadn't have been in bed beside me. 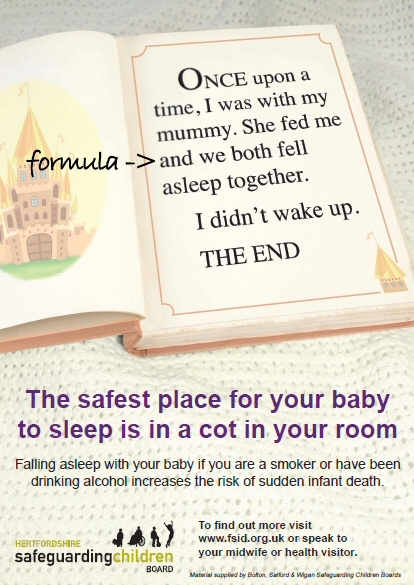 You can NEVER eliminate all risks, whether it's cosleeping or not, but you can minimise them. I am truly sorry to hear of your loss, but having done months of reading before my son was born, I found no evidence that safe bedsharing was more risky then cot sleeping. And I prefer to get my information from sites that are willing to engage in uncensored dialogue. Like AA.